There is something voyeuristic about reading personal correspondence between two people when you are not one of those people. And yet, you are compelled to continue, you can’t stop. Especially when the letters border on being love letters, but not overtly. 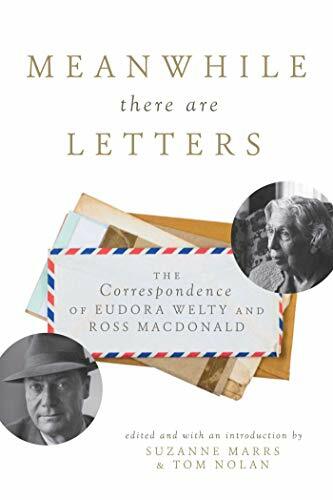 And so it is with Meanwhile There Are Letters, a compilation of the correspondences between Eudora Welty and Ken Millar (Ross MacDonald). One might think that there were no two more unlikely correspondents and yet to read their letters, one sees how they shared everything from literary experiences and friends, to bird watching, travel, and house renovations. Marrs and Nolan took great care to organize these letters into chapters by decade. In doing this, they clearly and carefully lead the reader through the relationship and how it developed into a quiet love story. They do this with the letters, but also provide the reader with commentary about Welty and Millar’s lives that may only be hinted at in the letters themselves. Millar was a married man, although his letters do not reflect a passionate relationship. He shared the grief of his daughter’s death with Welty, as well as his joy at spending time with his son-in-law and grandson after her death. For her part, Welty shared her deep compassion for his loss and expressed gratitude to him for sharing his joyful experiences with his grandson. Welty never interfered with the marriage and made a point of remaining away from it. She did, however, always ask about Margaret, or comment on anything that Millar might have said about her in a letter. Ken Millar shared with Welty references about his wife’s writing and their trips, but in correspondences on both sides, there references were more like afterthoughts that appear, more often than not, toward the end of a letter. Reading these correspondences also shed light on the literary world of the times. There are many references to the writings of others, reviews of their own works, meetings with other writers, as well as sharing books and articles with one another. The letters are responded to with some speed, and for the most part, there is joy in what is shared. They sometimes snipe at others, but always in an entertaining or teasing way. There are references to dreams they have of one another—certainly the unspoken reference to love. But always they tread gently around the deeper issue of their feelings. Both Eudora Welty and Ken Millar (Ross MacDonald) experienced successes with their writing that moved beyond just the written word. Welty saw her story The Robber Bridegroom adapted for a Broadway musical; Millar’s Lew Archer character was developed into a television series. The letters express their congratulations to one another for these achievements. The letters continued to reflect a further closeness in the Welty-Millar relationship as Welty spent time in Santa Barbara, CA, at Millar’s home, and returned on occasion at the encouragement of both Margaret and Ken Millar. Millar began to experience lapses in memory that dogged his writing, and in the summer of 1976 he shared with Welty these experiences. It was the first time he shared this information and in turn, Welty expressed her concern but with encouragement for his work. With the continuation of their letters, their expressions of love became more explicit. As Millar’s memory continued on its downhill course, the correspondence remained viable and constant, and it became apparent that Welty’s letters were an important part of his life. As the book progresses, Marrs and Nolan describe the health issues that befell Ken and Margaret. As his mental health declined, he also found himself tending to Margaret’s ill health. By 1979, the letters exchanged reflected his dependence upon Eudora for encouragement, and she always responded in kind. In 1980 Ken Millar was diagnosed with Alzheimer’s disease, and Eudora spent more time with him throughout this period. By the fall of 1980, their correspondence continued, but it was one-sided. Occasional letters to and from Margaret appeared, but it was clear that Eudora continued to write to Ken, even though he could not respond, because she had to. This continued until his death on July 11, 1983. Often times, the end of a book is greeted with melancholy, and so it is with Meanwhile There Are Letters. As outside observers, we learn about the daily routines of well-known persons through books and when it’s over, it’s over. But this book is different—we peer over the shoulders of Eudora Welty and Ken Millar and feel the intimacy of their lives, and we hate to see that experience come to an end. The art of letter writing is something that seems to elude us in today’s world. This story belongs on every writer’s bookshelf, on every reader’s coffee table. Perhaps it will encourage us to pick up pen and paper and write that elusive letter to someone we love—overtly or covertly.